Marcus and I went to Philly last weekend to visit Dan, one of my best friends from college. Krystal had given me a Starr Restaurant gift card for my birthday back in 2009, basically catalyzing my initial interest in Stephen Starr-designed restaurants when I was trying to decide which restaurant I wanted to try with her. Stephen Starr began his career in Philadelphia in night club design and in the entertainment business. He continued down this path, promoting live entertainment, which lead him to start his own company, The Concert Company, bringing in large-acts including Madonna, U2, and Bruce Springsteen to the Greater Philadelphia area. In 1990, when Electric Factory Concerts bought him out, he used the profit to open several new venues, both clubs and restaurants alike. Five years later, he founded STARR Restaurants, his multi-concept restaurant enterprise, now currently with an existing operating portfolio of 19 restaurants spanning along the East Coast from New York City, Philadelphia, Atlantic City, and Fort Lauderdale. During March 2009, after reviewing Mr. Starr's restaurant portfolio (and much, much contemplation), I decided on Tangerine, Starr's Morroccan-themed enterprise, now closed. 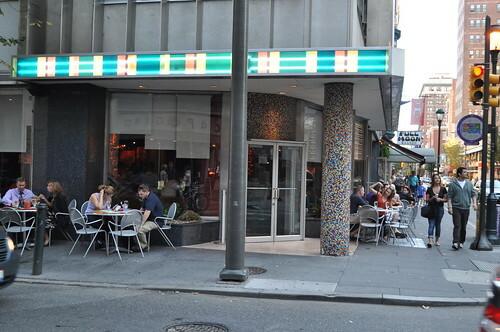 As restaurant-design fanatics, Dan and I had unofficially started what we called our "Starr Restaurant Tour" of NYC, Philly, and beyond. Since then, we've made it to (mostly in Philly): Alma de Cuba, Buddakan (NYC), Pizzeria Stella, Butcher & Singer, Barclay Prime, Continental Midtown, Jones (post to follow this one), Square Burger (still contemplating whether it will be worth blogging about), and related to this post, El Vez. Marcus, Dan, and I met up with John, Marcus's college friend, for dinner at El Vez this past weekend. Dan and I had long discussed how we wanted this to be our next "Starr stop", so this was something we definitely wanted to hit up during my next (subsequently, this) visit to Philly, so here there we went. 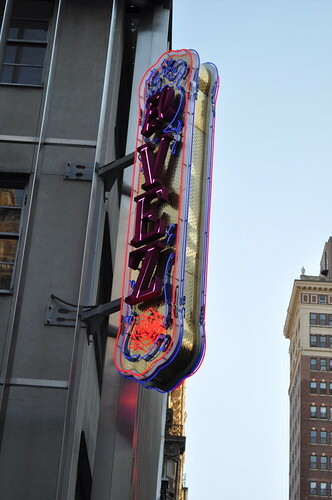 We knew Philadelphia Restaurant Week was coming up, so we thought we'd score a prix fixe deal at El Vez, but it turns out it started the next day. Not a loss though--I figured we would've gotten the "watered-down" version of El Vez if we had the Restaurant Week offerings, causing us to not have the full "El Vez" experience, so I'm glad we were able to order a la carte from the regular menu. 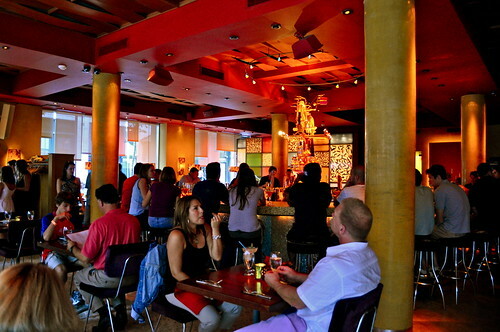 Inside El Vez and its bar scene--really liking the kitschy use of colors, adding to the authenticity of Mexican cuisine. More tables inside El Vez. I've never had a bad experience with the bar/drink menus offered at any of Mr. Starr's restaurants, so ordering a cocktail was a must. I ordered (seen in front) the guava mojito with 10 Cane rum, Cruzan guava rum, pink guava purée, and lime. I asked for no mint, which made me wonder if, at that point, is it was still a mojito sans the mint. Ever since my recent trip to Hawaii this summer, I've been missing the fresh guava juice offered so casually in island-wide supermarkets as well as in select drinks at Hawaiian Jamba Juice stores! Now whenever I see guava on a drink menu, I immediately have to order it (see mimosa flight I mistakenly ordered at Jones in upcoming post). 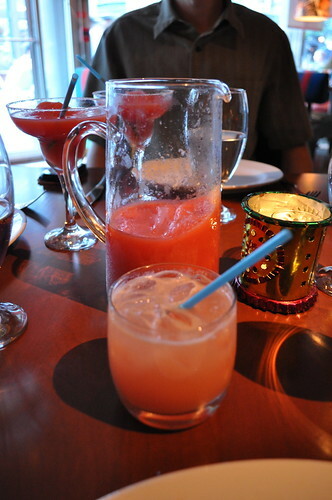 The guys ordered a pitcher (seen behind my mojito) of the frozen blood orange margarita with silver tequila, triple sec, and fresh blood orange purée. Very strong tequila-wise, but flavor was still intact. John ordered El Vez enchiladas mixtas, a tasting of all three enchiladas offered on the El Vez menu, with traditional garnishes. 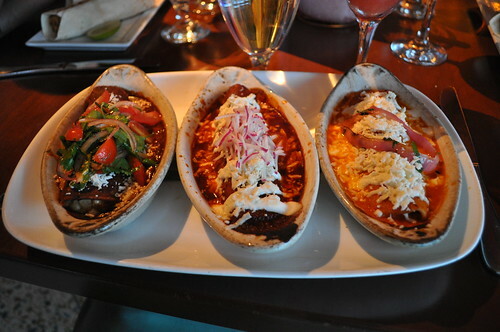 From left to right: shrimp enchilada with sweet corn, Oaxacan cheese, and roasted red pepper and almond sauce; classic red chile and chicken enchilada with crema fresca, radish, and cotija cheese; and black bean enchilada with caramelized onions, chihuahua cheese, and smoked yellow tomato sauce. A little too cheesy for my lactose tendencies, but from what John reported, they were delicious--from what I recall, he said he enjoyed the chicken enchilada the most! Dan and Marcus had the crispy mahi-mahi tacos with red cabbage and chipotle pepper remoulade. It was probably one of the best tacos I've ever had--lightly breaded and fried mahi-mahi filets wrapped in toasted flour tortillas with some avocado and red cabbage, complemented with the remoulade, which was basically a spicy tartar sauce. Great content-tortilla ratio, which makes for a very solid fish taco! 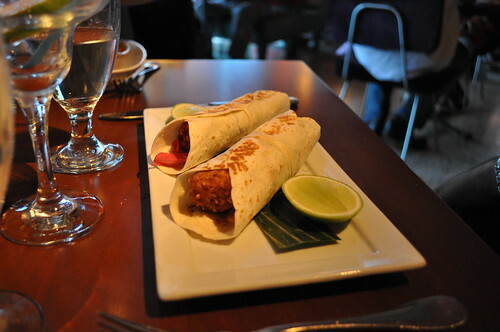 Definitely a highly recommended dish for anyone who's planning to make a stop at El Vez! I went with the Ahí tuna tacos with mango and jicama salsa, cascabel chile and agave vinaigrette, and black bean puree, as they were dairy-free! Very refreshing summer ingredients. However, my only complaint was that there either wasn't enough vinaigrette or flavor in the vinaigrette to bring out the tastes of the tuna and salsa. This would be a better dish if the flavors were slightly stronger. The best part of this dish was probably the physical dish itself--love the unusual design! 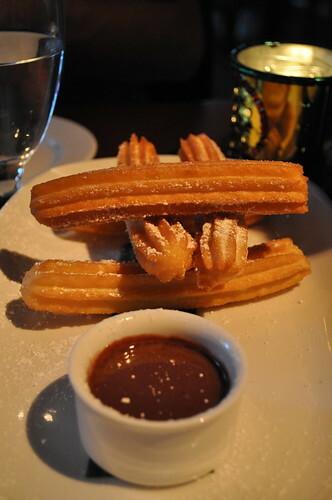 We all shared an order of churros (fried-dough pastries or "Spanish doughnuts") with dark and Mexican chocolate sauce. They had a nice crunch and had just the right amount of dusted makara cinnamon. The chocolate sauce resembled the consistency of hot chocolate, which I found to be different from the chocolate sauce I'm used to on ice cream sundaes, and was very raw yet rich in flavor. Great way to end a filling meal. 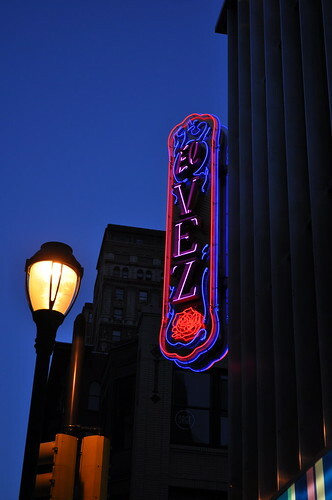 El Vez's neon sign at dusk. 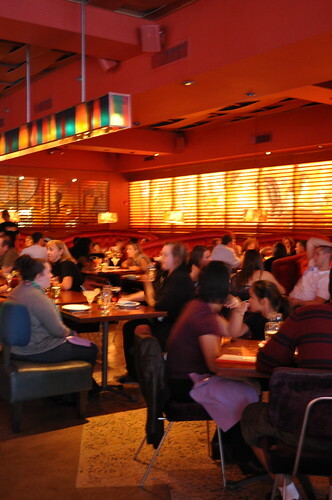 Findings: The decor and ambience of El Vez, along with most of the other Starr restaurants I've been to, largely contribute to, if not define, the overall dining experience. Mr. Starr has the flair for creating very mesmerizing and provocative restaurant concepts with a particularly meticulous design execution. Sometimes I feel the design overpowers the respective menu offerings in many instances, where the food doesn't even stand a chance. 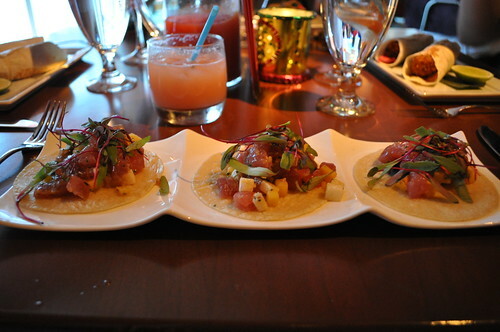 Luckily, the mahi-mahi tacos (as well as drinks we had) were worth making the trip to El Vez! All in all, I would recommend going for tapas sharing, some guacamole (which I would love to try sometime), and pitchers of frozen margaritas! Price point: $9 for guava mojito, $33 for pitcher of frozen blood orange margaritas; $11-18 for each entrée; $7 for an order of churros (5 total).